Xander is only 11 years old and he’s already over 6 feet tall. He hates basketball and knows he’s not the athletic son his father wanted. He decides to show the gym rats he can beat them at their own game. Roland, Timothy. Comic Guy: Our Crazy Class Election. N. 2007. The first in a series. Guy maloney is trying to find material for his school newspaper comic strip. 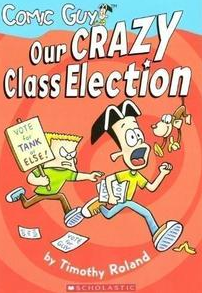 He decides to run for homeroom president against Tank, the school’s biggest bully, and Ollie, the science room pet monkey. Kline, Suzy. Horrible Harry and the Ant Invasion. N. 1989. Harry has been chosen to be “ant monitor” for his class. 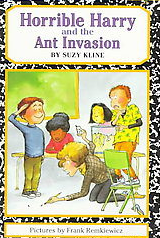 When a few of the ants manage to escape, Horrible Harry knows exactly what to do. Ivy Bean and the Ghost That Had to Go. 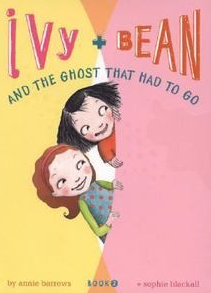 M.
Second in a series, Ivy and Bean discover a ghost in the school bathroom, and they have to figure out how to get the ghost out of the bathroom before the teachers find out. 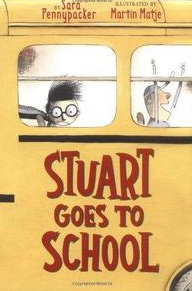 Stuart Goes to School. M.
This book is a very funny sequel to Stuart’s Cape, by the same author. Stuart is worried about starting third grade, and he wants to wear the cape he made. 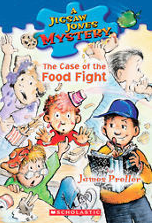 The Case of the Food Fight. M.
Preller, James. The Case of the Food Fight. M. 2005. This is a Jigsaw Jones mystery. It is 28th in the series. Everyone blames Joey Pignatto for starting a food fight in the school cafeteria, but Jigsaw jones doesn’t believe it. Now Jigsaw and his partner Milah Yeh have only 24 hours to clear Joey’s name. Buster Makes the Grade. M.
Brown, Marc. Buster Makes the Grade. M. 1999. 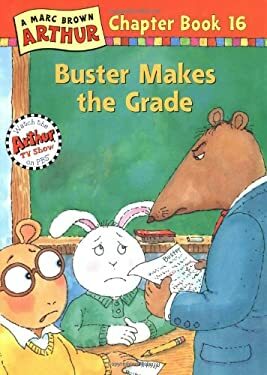 This Arthur book is actually about Buster. Buster needs to get at least a B on his last math test of the year, or else he’ll have to repeat third grade! Can his friends help him get good study habits?